CHICAGO: Soldiers and volunteers packed sand bags Wednesday in a frantic effort to stave off floodwaters in the US state of Missouri, where 13 people have been killed and several towns have been engulfed. The Mississippi River is already more than 14 feet above flood stage in some areas and is forecast to rise another eight feet before cresting today, according to the National Weather Service. “We’ve never seen water this high,” Missouri Governor Jay Nixon told CNN. Don Smith, the mayor of Rockaway Beach, a small resort town in the southern part of the state, calling the flooding “absolutely devastating” and pleaded for help. “I don’t even know how we’re going to deal with the clean-up,” Smith told CNN. “One of the business owners has an antique shop: there were minnows inside.” The images shown by local media were dramatic. Muddy water inundated homes and businesses nearly to the rooftops. Hundreds of volunteers formed human chains to spread sandbags on levees before the rapidly rising water could overflow them. A man and his dog were rescued by boat from the roof of a home that was almost completely submerged near the Missouri town of Eureka. Another man was towed out of the floodwaters with his legs dangling out the back window of his pickup. Nixon urged residents to stay out of the frigid and fast-moving waters. Most of the 13 victims in Missouri died when their cars were swept away. “It’s cold,” the governor said. “It’s dangerous.” The United States has been hit by a wave of wild weather-tornadoes, floods and rain-that has claimed at least 51 lives in the past week and stranded millions trying to get home after the Christmas holiday. 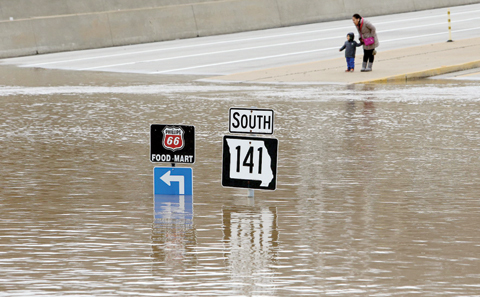 So far, the flooding in Missouri has only affected small towns and rural areas. But the Mississippi is forecast to approach or even exceed record highs in the heavily-populated St Louis area on Thursday, and Nixon said he is “very concerned” about the safety of residents there. “You don’t know where that water is going to go,” he said. It could take about a week for the river to drop back down below flood level, the weather service forecast. The flooding began last week after a massive storm system dumped as much as 10 inches (25 centimeters) of rain in some parts of the state. Nixon declared a state of emergency on Sunday and called in the National Guard Tuesday to help local officials deal with the rare winter flooding-the result of a monster storm system that also unleashed tornadoes and freezing rain. Neighboring Illinois has also been hard-hit. The storm claimed the lives of five people swept away while driving on a flooded roadway, and a state of emergency was declared in seven counties. The wild winter weather has killed 11 people in Texas, 11 people in Mississippi and six in Tennessee. Alabama and Arkansas each reported two storm-related deaths while Georgia blamed one death on the nasty weather.